Happy Monday, everyone! I hope you all have been having a great start to the new year. 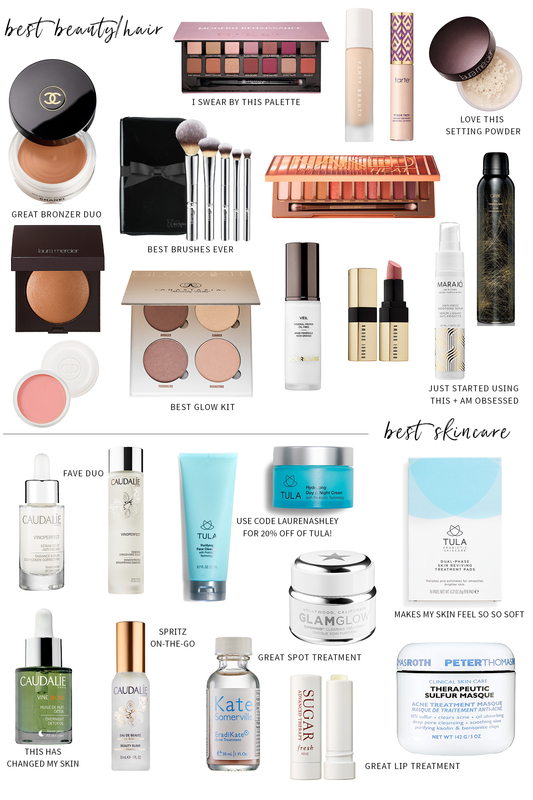 While I don’t have new clothes content for right now, I did want to share my favorite makeup, skincare and hair products of 2017. I’m planning on going full-force back into TFD on Monday, January 29th, but will be doing roundups between now and then and hopefully getting some cute IG shots for you, too. I’m also currently on the hunt for affordable items to style for you guys and can’t wait to show you what I get and how I style it! Chanel Cream Bronzer: I love applying this bronzer with a damp Beauty Blender on my cheekbones and my hairline. Then I go in with another bronzer (usually my Laura Mercier one) to blend everything together. It has such a pretty color and is easy for rookies like myself to apply! I’ve had it for over a year so it’s well worth the price tag. Anastasia Modern Renaissance Palette: this is a DREAM! I am obsessed with everything about this palette. I use this the most on a daily basis and have a tutorial on what colors I use up on my Instagram highlights. Fenty Beauty Foundation: I got this foundation a little after it came out and can honestly say it’s one of my favorites. It stays on all day, doesn’t irritate my skin and looks flawless! Tarte Shape Tape Concealer: this is the only concealer I use and I don’t think I’ll ever want to use another one. I’ve switched to others before but always end up coming back to this one. It’s not that expensive and lasts a long time! Laura Mercier Transluscent Powder: I’ve had this for years but every year it continues to be a favorite beauty buy. It sets my makeup and just makes everything look smooth. IT Cosmetics Brushes: IT Cosmetics makes some of my favorite makeup brushes. If you’re starting out with their brushes, I recommend this kit. They clean easily, apply your makeup SO well and are just great quality. Naked Heat Palette: I received this palette earlier in 2017 when it first launched and it took me a while to first use. But, now that I’ve used it, I love it. I think Urban Decay honestly makes my favorite palettes because the colors are so pigmented and the colors are my favorite. Laura Mercier Bronzer: this has been my go-to bronzer for a few years now (in color 03). It’s matte so it works well with oily skin types and it lasts a really long time. A little bit goes a long way with this one! Dior Lip Balm: this smells so good and really makes your lips feel so soft! I first got it after my sister got it as a gift and haven’t looked back since. Anastasia Glow Kit: I love this kit so much! It adds the perfect amount of glow without being overdone. Also, the bronzer is a really pretty color too if you wanted to apply it to your cheekbones. Hourglass Veil Primer: I used to swear by the Laura Mercier primer but have used this one for almost 1.5 years now and haven’t looked back since. It sets the perfect primer to apply your makeup smoothly and flawlessly and doesn’t irritate the skin. Bobbi Brown Luxe Lip: I love this lip color. It’s hydrating, pretty and lasts. I have it in Pale Mauve and Pink Cloud! Marajo Hair Serum: I got this towards the end of the year and now can’t live without it. I get out of the shower, towel dry my hair and apply this. It helps my hair feel smoother and less frizzy after a blow dry (or even if I just air dry it). It’s not that expensive and honestly feels like a million bucks. Oribe Dry Texturizing Spray: you know I’m a huge fan of this! It adds volume to the top of my hair and throughout my waves to give them that “undone” look. It also smells amazing. I definitely overuse this and buy about 3 a year (haha, oops!). Caudalie Vinoperfect Radiance Serum: this has helped my skin with hyperpigmentation so much! I use it in the morning and at night. It helps brighten, even out and hydrate the skin. I use it with the Essence and it’s changed my skin discoloration. Caudalie Brightening Essence: I use this before the Radiance Serum and it’s amazing! I almost thought I broke it the other day and freaked out but, nope, it’s okay! It doesn’t have a strong smell to it (which I like) and feels so lightweight. It really has helped my skin’s acne dark spots. Caudalie Overnight Detox Oil: ugh. GAME CHANGER. If you want your skin to feel fresh, clean and hydrated upon waking up… get this. I can’t live without this. I have 2 of them in my medicine cabinet! Caudalie Beauty Elixir: I use this on-the-go to set my makeup, hydrate my skin and reduce the appearance of pores. I have 2 of the regular size and one travel size. My dad even uses it as an after shave! Tula Day & Night Cream: this is the only moisturizer I use because it’s super hydrating and sometimes I get dry skin from any acne products I put on it. You can use the same code as above for this! Kate Somerville Acne Treatment: I use this as an overnight spot treatment whenever I have a pimple or feel one coming. It works! Sugar Lip Therapy: I keep this in my purse at all times and use this under my lipstick. It helps my lipstick apply beautifully and keeps my lips hydrated throughout the day. Glamglow Supermud Clearing Treatment Mask: this is my ride-or-die mask. I will use other masks but this one continues to be my #1 (followed closely by PTR at second). Tula Treatment Pads: these are new at Tula and oh my gosh I am in love! They make my skin feel SO soft and take off all of the dead skin. I’m seriously obsessed and use it 2-3 times a week. If you get one skincare item, get this. (Code: LAURENASHLEY for 20% off). Peter Thomas Roth Acne Treatment Mask: this is my second favorite mask! I love the sulfur in it and it feels good on my skin plus I kind of like the smell! It really depends on what you’re looking for in a mask but this one is another favorite of mine. I am so behind in testing new beauty products. I haven’t tried a single thing in these collages. So many beautiful options! These all look amazing! I need to try them! Love all your favorites. Need to try a few for myself! These look incredible! I love the chrome look of those brushes! So many amazing things! LOVE that Anastasia Glow Kit. These are all great!! I want to try the Tula products so bad!! Such a great round up! I would love to try the hair products you mentioned.